For those who haven’t heard, we have a new train service here in South Florida. Brightline, billed as “the only privately owned, operated and maintained passenger rail system in the United States”, debuted in the spring of 2018. We’ve taken it a few times, primarily for pleasure trips between Fort Lauderdale and Miami. Recently, I needed to attend a business event in Miami, and decided to keep precise track of the difference between driving and taking Brightline. Brightline definitely beat the competition, aka my beloved Chevy Camaro (it’s a bright yellow convertible, BEST CAR EVER; thanks for asking). Driving: Round-trip from home to my destination is about 75 miles, so the gas would cost about $16 (I’m rounding; live with it). Parking in downtown Miami can run anywhere from $10 to valet at (I am not making this up) $45. Let’s split the difference and say it cost $20. So the cost to drive would be about $36. Brightline: Normally, it would take 20 minutes to get to the station. I left at the beginning of rush hour, so it took me 30 minutes. But because I wanted to leave extra time in the event of traffic or unexpected snafus at the station, I’d allotted 45 minutes to get to the station. 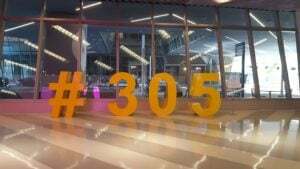 The Brightline travel time from Fort Lauderdale to Miami is 35 minutes. Once arriving in Miami, it was a short walk to the Metromover (a cute little Monorail-y thing that runs in a loop, so you don’t have to worry too much about missing your stop. If you do, just stay on and eventually you’ll get back there. But it’s hard to miss your stop – the electronic signs on board and the intelligible announcements make getting off at the right place pretty easy). The Metromover portion of the trip took 5 minutes. And yeah, ok, these stations feel more like the NYC subway stations, which is to say “not great.” But it’s efficient, and free. Walking from the Brightline station to the Metromover, and then walking from the Metromover to my final destination, took a total of fewer than 10 minutes, but we’ll round it to ten. Total time: 90 minutes. And here’s the predictability thing: barring a complete and total traffic nightmare en route to the Fort Lauderdale station, it’s pretty much guaranteed that I’ll arrive on time at my destination, which is utterly untrue when I’m driving. Driving: As noted earlier, it’s 75 miles round trip, which (for the math-challenged) means it’s 37.5 miles one way. Now, here’s the unpredictability thing: this trip can take anywhere from 50 minutes to an hour and 40 minutes. WTF! That’s 10 minutes more than the train, not to mention a variance of almost an hour. So you have a choice of (a) being ridiculously early, (b) maybe being on time (trust me, there’s like a 5% chance of that) or (b) being up to an hour late (rounding!). And, that hour and 50 minutes assumes that nothing really bad, like Florida-level bad, happens. This trip has taken me 2 1/2 hours, and trust me, after an experience like that, you’ll know why the news is full of all those Florida stories (like this one, #1 on my personal Hit Parade of Florida Stories, when an attorney’s pants caught on fire). In case you don’t feel like reading about this (what IS WRONG WITH YOU? ), they did not catch on fire because he was lying about how bad the traffic was that day. But back to math (sorry): I have to allow two and a half hours for this trip just in case, because I can’t be late. Anyway, in the Time Wars, Brightline wins. There are just too many things that could go wrong on the roads, like goats stuck on a bridge (gotcha! That happened in Pennsylvania). Miami Central, the Brightline Miami station. This might be the most important factor of all. I love my car. I enjoy driving it for, like, 10 miles at a time. Then I’m done, finito, over it: the gas, the wear and tear, the constant fear that some lunatic is going to lose control of their 42,000-pound SUV and careen across four lanes of traffic at 80 miles an hour and pulverize me. No thanks. Plus, I have to be alert at all times, and I can’t drink (I can’t drink on this trip either, because I still have to get to and from the station, but I could Uber/Lyft/take the bus for that portion, and then indulge). But the real sanity savior here, beyond the predictability, is how utterly pleasant Brightline is. The stations are pretty, and happy, and, well, bright! Plus, they smell amazing. They really do; it’s like entering some magical world where everything is shiny and the people are smiling – all of them. Even the employees! It’s fantastic. The Brightline staff is so helpful and pleasant, you feel like any minute they’re going to start cheering you on as you board the train. On the way home, I was able to catch an earlier train, thanks to the friendly and helpful Brightline staffer (I could have done this using the Brightline app, but of course I couldn’t remember my password). Once you do board, there are four ways to charge your devices at every seat; two plugs and two USB ports. That was more than even I need, and I’m a charging station glutton. See above, the bit of walking I got in during the trip. My Fitbit was so happy that it clapped (no it didn’t; I haven’t gotten the Talking Fitness Tracker built yet). I got in roughly 20 minutes of walking that would never have happened if I’d driven the whole way. Brightline takes the Health category. The entire Brightline environment somehow (for me anyway) lends itself to being more social than I normally am. It’s fun to people-watch and it’s cute to see families excited for their train trip; today, there was a young family with a little boy who was so excited about the train (I’m pretty sure that boys=train love; it’s like a universal law). The best part was, they were on the same train as I was coming home! The little boy recognized me and we had a lovely chat about how much fun we’d all had in Miami. Those interactions are so rare today, because we’re so buried in our devices. On the train itself, I could work, but I don’t. It’s a quick enough trip, and (unlike when I’m driving), I can just sit back and watch the scenery go by, something all of us could stand to do more of. In the car, of course, my social interaction is nonexistent; screaming at other drivers doesn’t count. And unless you have a belief in your own immortality, I do not recommend talking on the phone (Bluetooth or not) when you’re on this Death Race 2000 of a drive. So Brightline beats driving in the Social Interaction Competition. If you can take a train, do so. If you can’t use it for your commute, then take it on one of your days off. I bet you’ll enjoy it more than you’d expect. Most of us could stand to do more walking. Taking a train, or really any form of public transit, almost guarantees that you’ll get in at least a few extra steps. Put down your phones! Use the opportunity that any form of public transit provides to look around at your fellow humans. Yes, I know that sometimes this will be horrifying, but I’m guessing it will leave you feeling better than you might think. If your city/town/metro area is considering expanding/implementing some form of public transit, get involved and check out the plans. You’ll probably be pleasantly surprised at how much you personally might benefit.